We’ve made our Jack-O-Lantern Pencil Holder, now we need something to put in them. 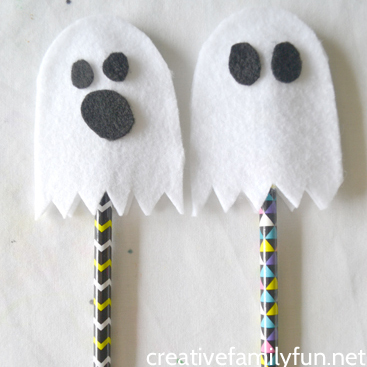 How about a No-Sew Ghost Pencil Topper? These are so easy to make and they would make a perfect classroom treat, since they are simple and inexpensive. Plus, there’s no sugar! Let’s grab a few supplies and get to work. This post contains Amazon Affiliate and other affiliate links. Please see my Disclosure Page for more information. Start by creating a simple pattern with your scrap paper. You will want all of your ghost pieces to be the same size and shape. Use your pencil to get an idea of the size. You’ll want it to fit easily over the top of the pencil, but not be too long. I drew the jagged edge on the bottom of my pattern, but ended up just cutting a straight edge. I found an easier way to do that jagged edge and I’ll tell you about it later in the steps. 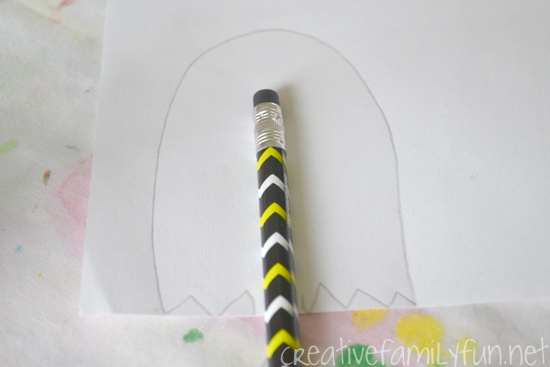 Use your pattern to cut out two pieces of white felt per pencil topper. When I first cut these out, I left the bottom straight, then held the two pieces together. I was able to cut the jagged edge on both pieces at one time. It was much easier this way and helped ensure that both pieces were identical. After you have your white pieces cut, cut a few face pieces from your black felt. I did not use a pattern for this because the pieces were small. 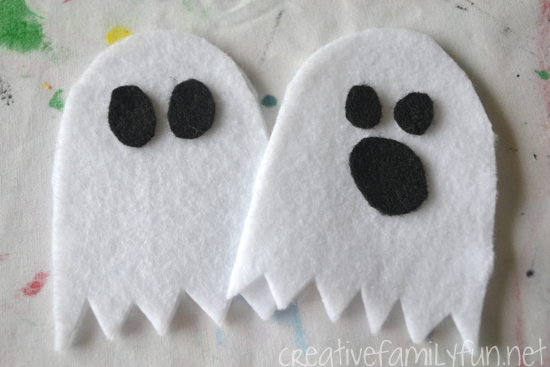 Plus, without a pattern, you can make different faces on all your ghosts. You’ll just need two to three small round pieces for each ghost. 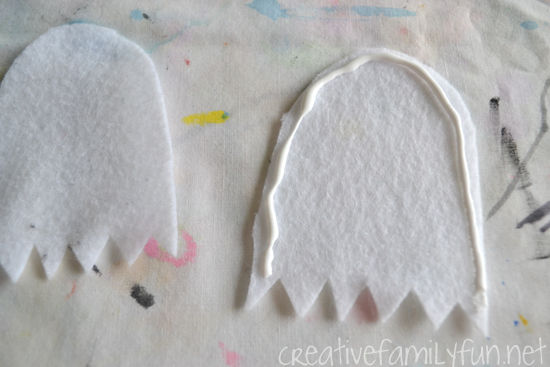 Use your Tacky Glue and run a thin line of glue around the outer edge of one of your ghost pieces. Just do the top and side. You need to leave the bottom open so you can slip your pencil inside. Carefully line up your two pieces and attach together. Hold together for about 30 seconds to make sure they stick together. 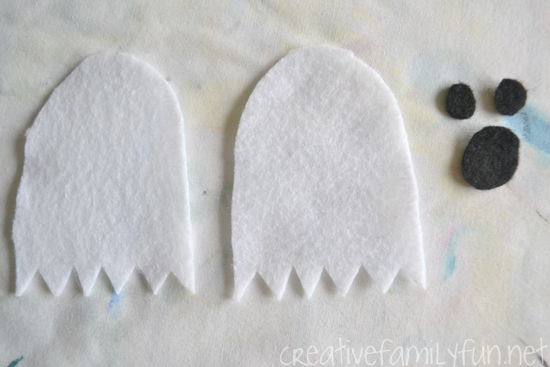 Next, glue down your black pieces to make your ghost faces. Make sure to let your ghosts dry thoroughly while lying flat. Once they’re dry, it’s time to pop them on the top of your pencil. 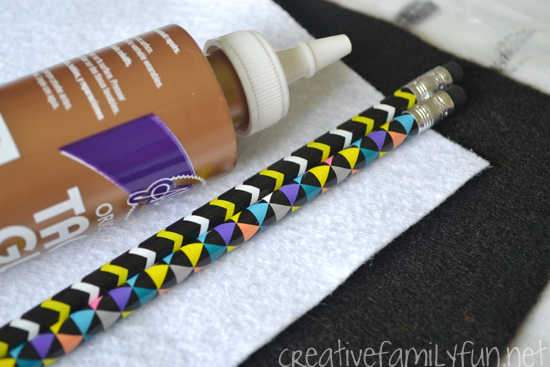 This craft is easy enough for your elementary-aged kids and tweens to do themselves. Let them make a few for their friends or you can even make a whole pile for the classroom. 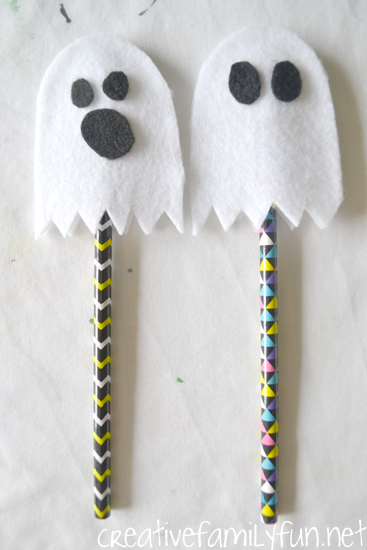 If you’re making these in bulk, you can get approximately four to five ghost pencil toppers from each sheet of white felt and countless face pieces from your black felt. It’s a very inexpensive craft to make for a group. 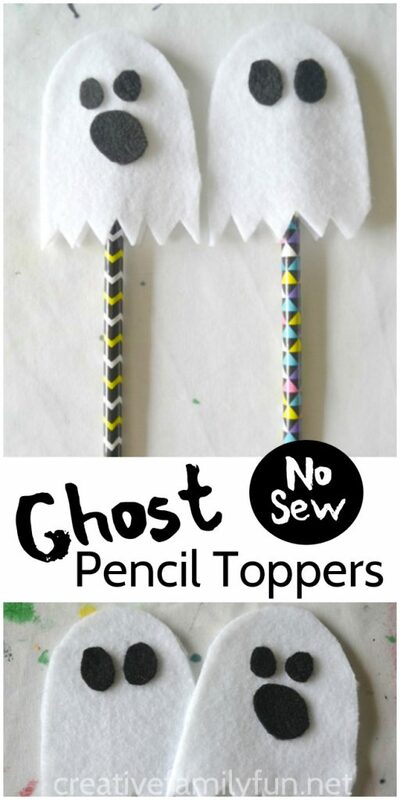 If you enjoyed this No-Sew Ghost Pencil Topper, the above photo is perfect for sharing on Facebook, or you can save the photo below on Pinterest.